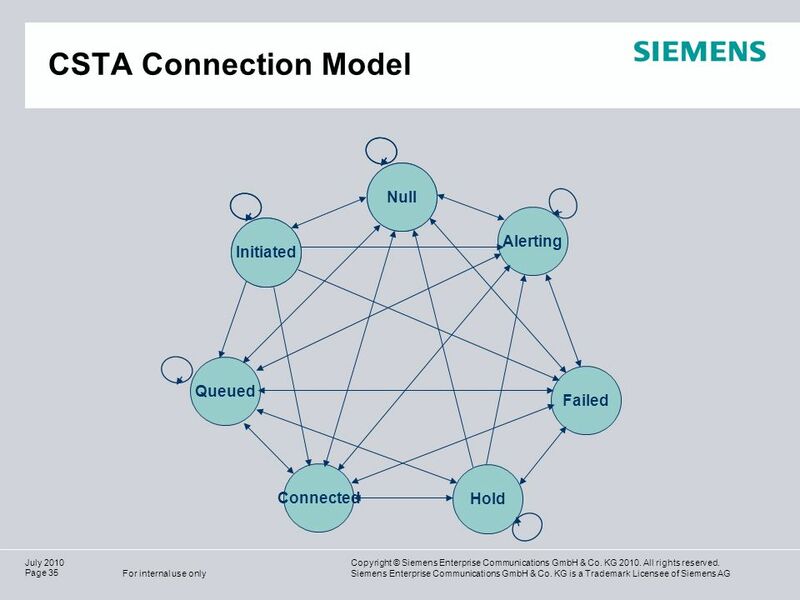 Copyright © Siemens Enterprise Communications GmbH & Co. KG 2010. All rights reserved. 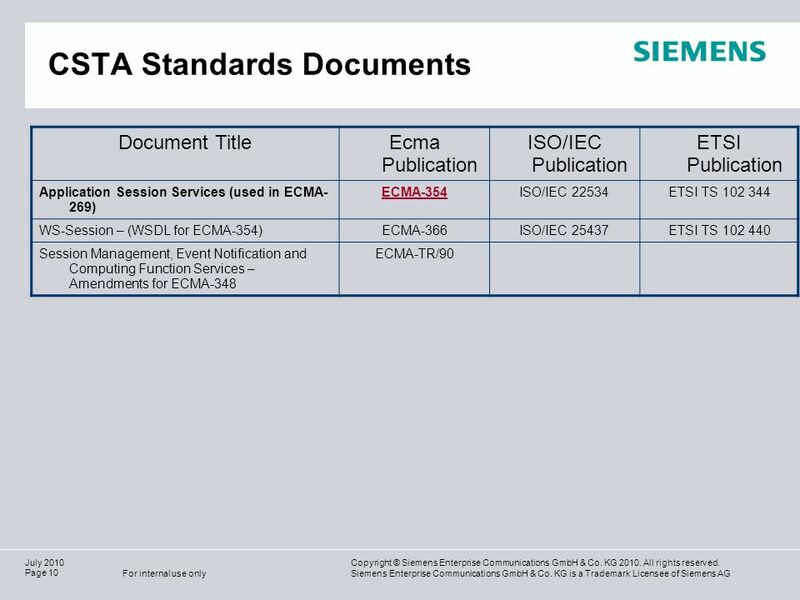 Siemens Enterprise Communications GmbH & Co. KG is a Trademark. 12 9,825,461,087,64 10,91 6,00 0,00 Copyright © Siemens Enterprise Communications GmbH & Co. KG 2010. All rights reserved. 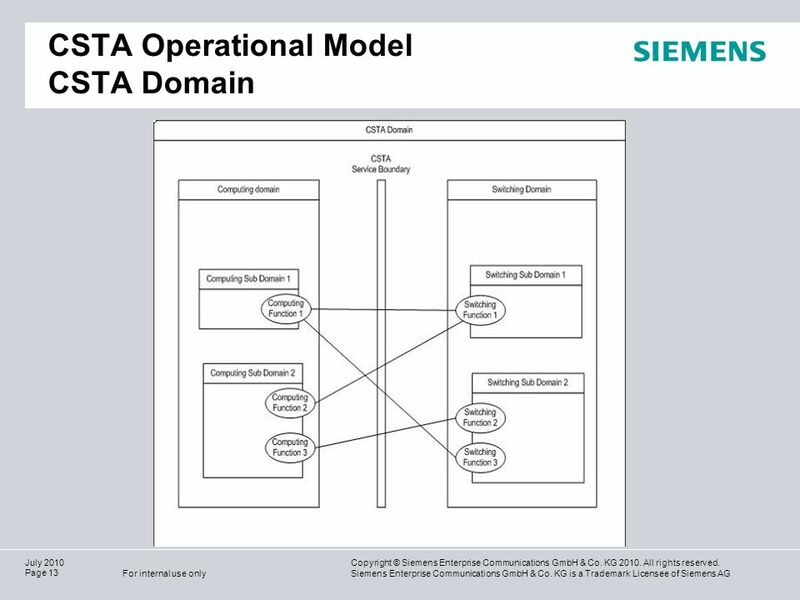 Siemens Enterprise Communications GmbH & Co. KG is a Trademark Licensee of Siemens AG For internal use only Page 12 July 2010 CSTA Operational Model CSTA operation model consists of computing and switching domains / sub-domains. 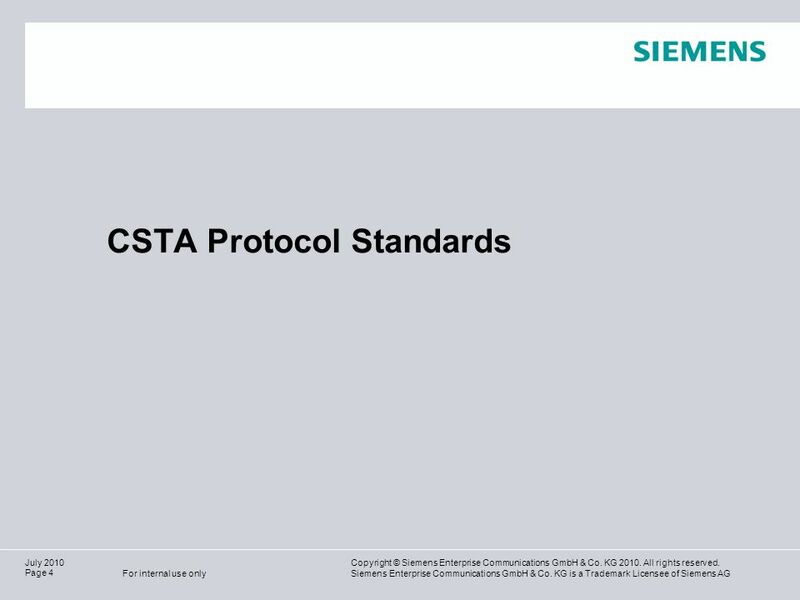 The CSTA standard defines the interface between the 2 domain types. 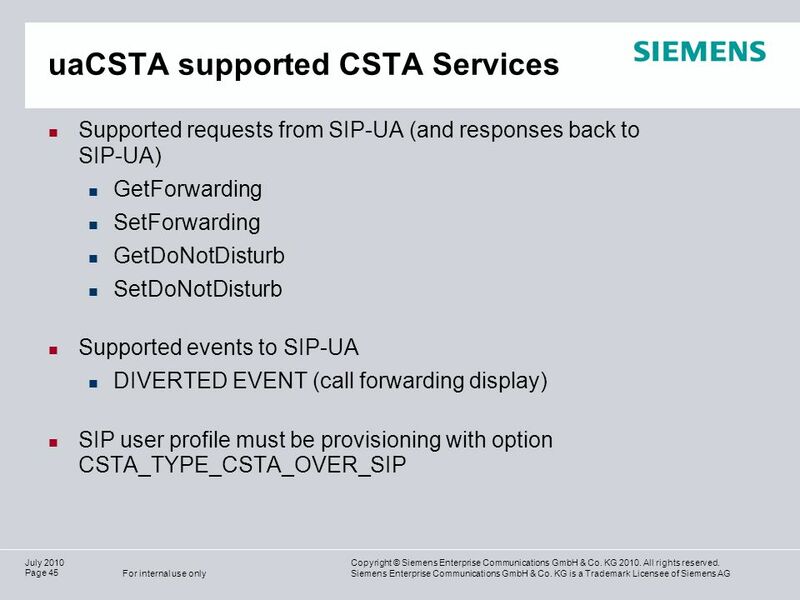 CSTA Standard specifies the messages (Services and Event Reports), and their associated behavior. 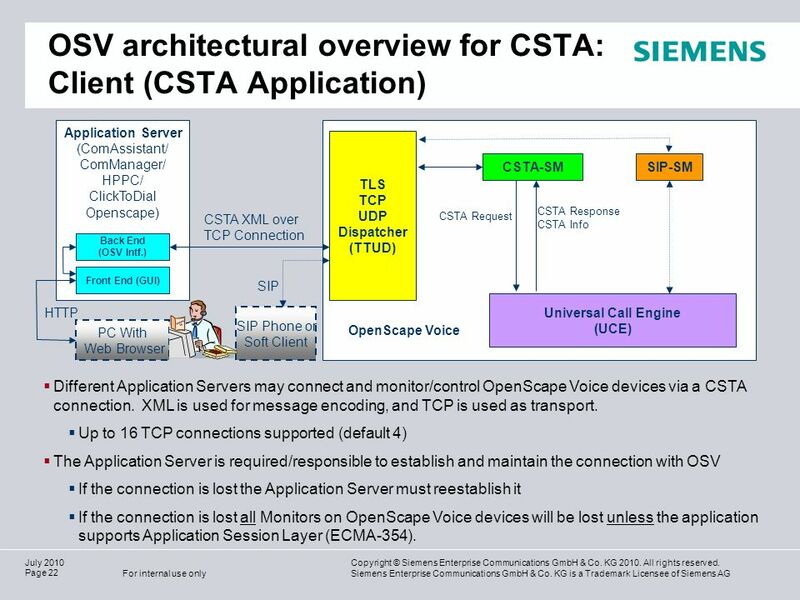 Computing Domain – is the environment/host for CSTA applications that interact with and controls the switching domains. 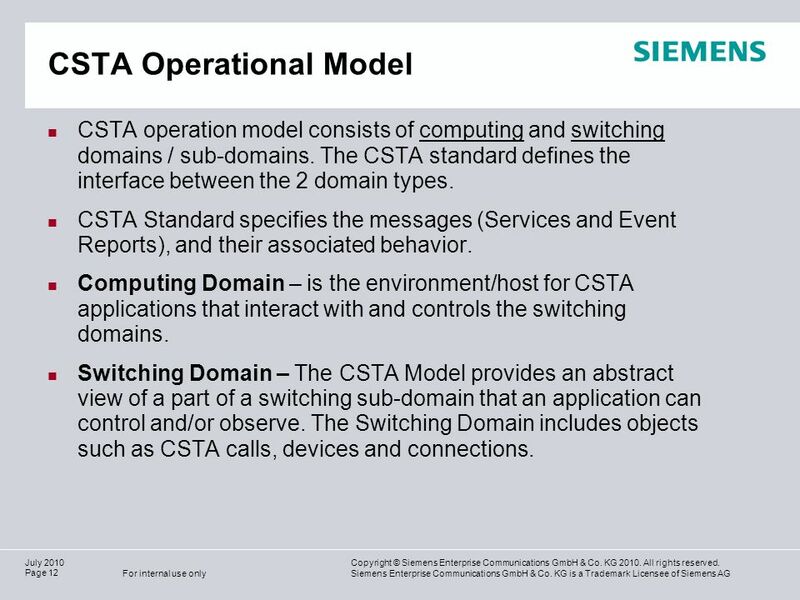 Switching Domain – The CSTA Model provides an abstract view of a part of a switching sub-domain that an application can control and/or observe. 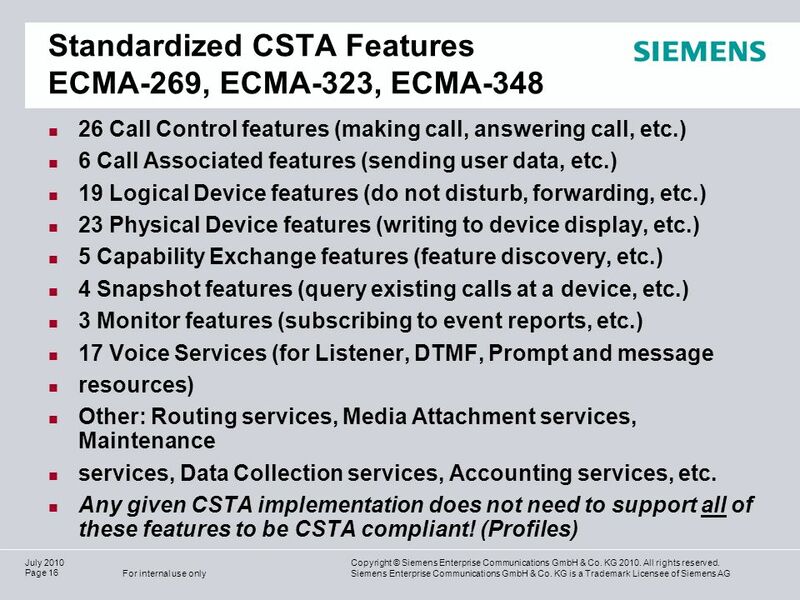 The Switching Domain includes objects such as CSTA calls, devices and connections. 24 9,825,461,087,64 10,91 6,00 0,00 Copyright © Siemens Enterprise Communications GmbH & Co. KG 2010. All rights reserved. Siemens Enterprise Communications GmbH & Co. KG is a Trademark Licensee of Siemens AG For internal use only Page 24 July 2010 Features: Call Control Events OpenScape Voice currently supports the following events (V3.1): Events: Bridged, Call Cleared, Conference, Connection Cleared, Delivered, Digits Dialed, Diverted, Established, Failed, Held, Network Reached, Offered, Originated, Queued, Retrieved, Service Initiated, Transferred. 26 9,825,461,087,64 10,91 6,00 0,00 Copyright © Siemens Enterprise Communications GmbH & Co. KG 2010. All rights reserved. 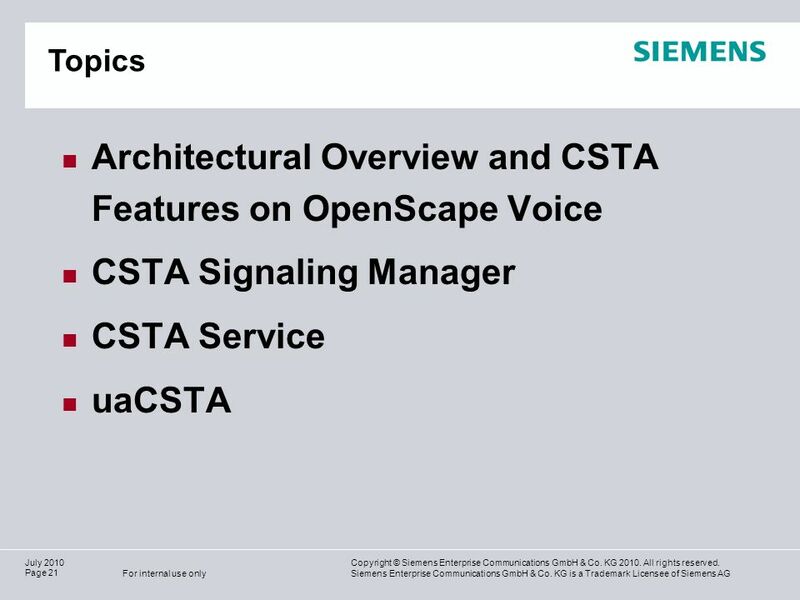 Siemens Enterprise Communications GmbH & Co. KG is a Trademark Licensee of Siemens AG For internal use only Page 26 July 2010 Features Capabilities Exchange Services OpenScape Voice currently supports the following services (V3.1): Get CSTA Features: The Get CSTA Features service obtains the list of CSTA services and events supported by the switching function (OSV). Get Logical Device Information : The Get Logical Device Information service is used to obtain the current set of characteristics/capabilities associated with the logical element of a given device. Get Switching Function Capabilities : The Get Switching Function Capabilities service is used by the computing function to obtain the current set of capabilities for the entire switching function Get Switching Function Devices : The Get Switching Function Devices service is used by the computing function to obtain the current set of devices in the application working domain along with their associated device categories and associated device names. Switching Function Devices : The Switching Function Devices service is used by the switching function to provide a list of devices in the application working domain. 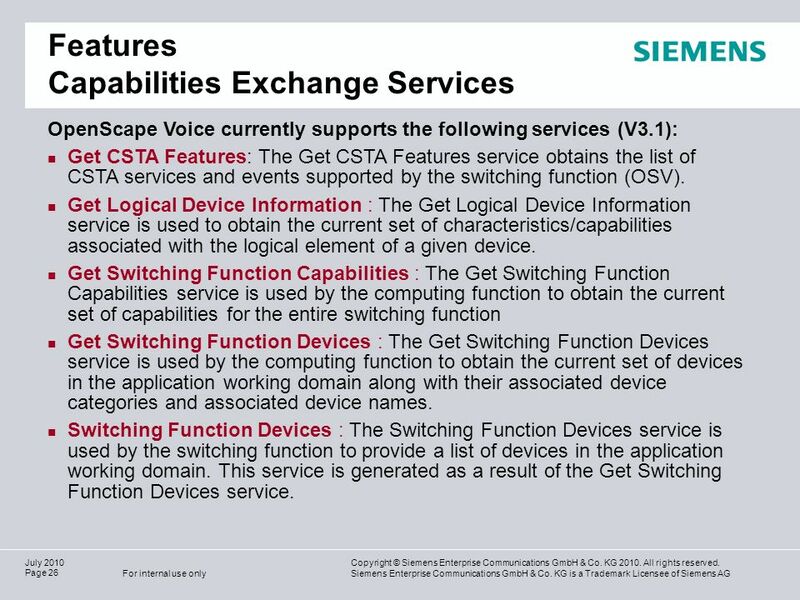 This service is generated as a result of the Get Switching Function Devices service. 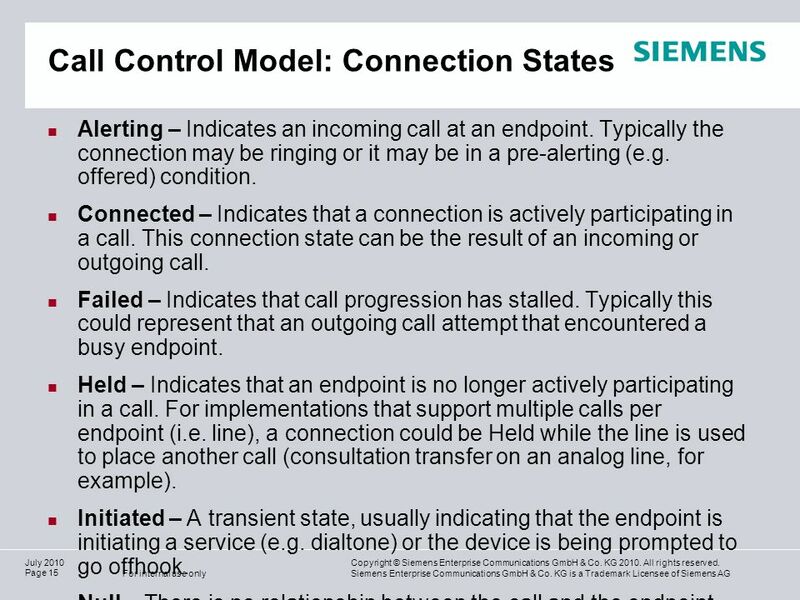 27 9,825,461,087,64 10,91 6,00 0,00 Copyright © Siemens Enterprise Communications GmbH & Co. KG 2010. All rights reserved. 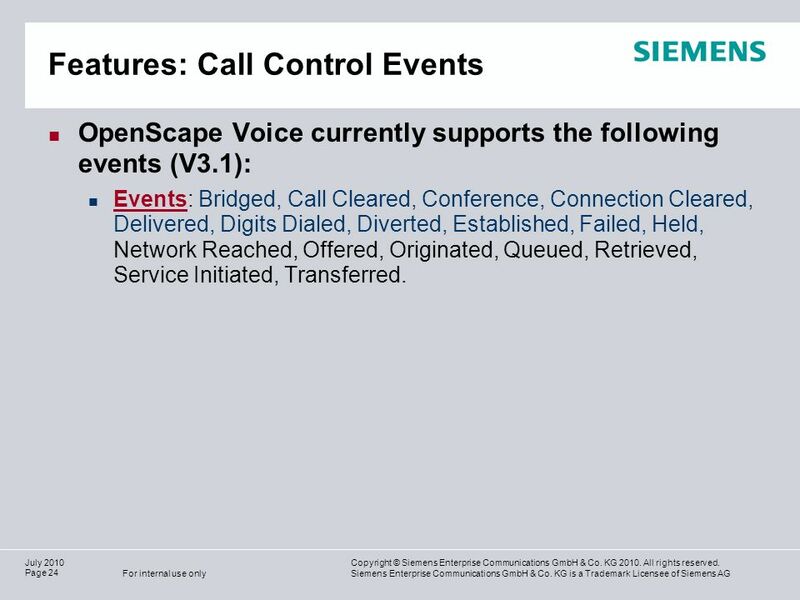 Siemens Enterprise Communications GmbH & Co. KG is a Trademark Licensee of Siemens AG For internal use only Page 27 July 2010 Features Physical Device Services OpenScape Voice currently supports the following services (V3.1): Get Message Waiting Indicator : The Get Message Waiting Indicator service provides the message waiting feature status at a specified device. The message waiting feature is typically used to notify a user (typically via a dedicated lamp on a phone device) when messages are available. Get Microphone Mute* : The Get Microphone Mute service provides the microphone mute feature status of a microphone associated with an auditory apparatus at a specified device. Get Speaker Volume* : The Get Speaker Volume service provides the speaker volume setting for the speakers associated with one or more auditory apparatuses at a specified device. 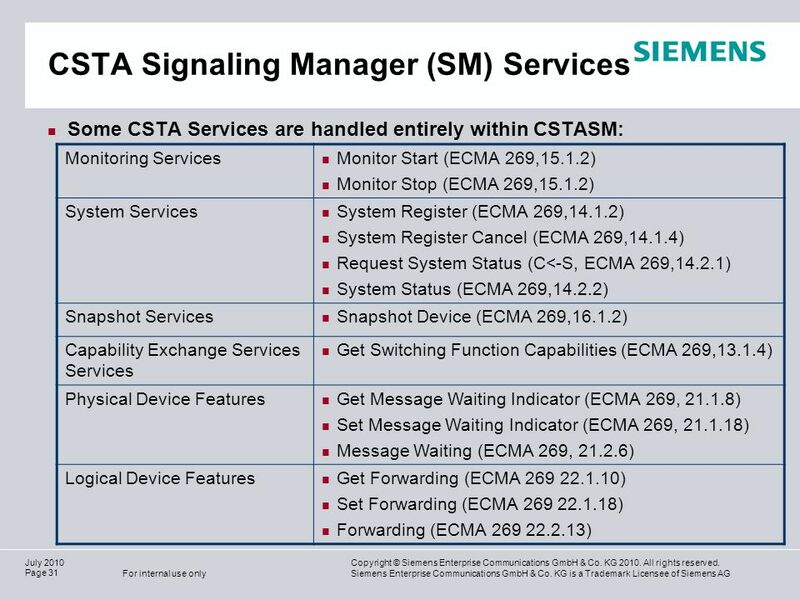 Set Message Waiting Indicator : The Set Message Waiting Indicator service allows a computing function to control the status of the message waiting feature at a specified device. 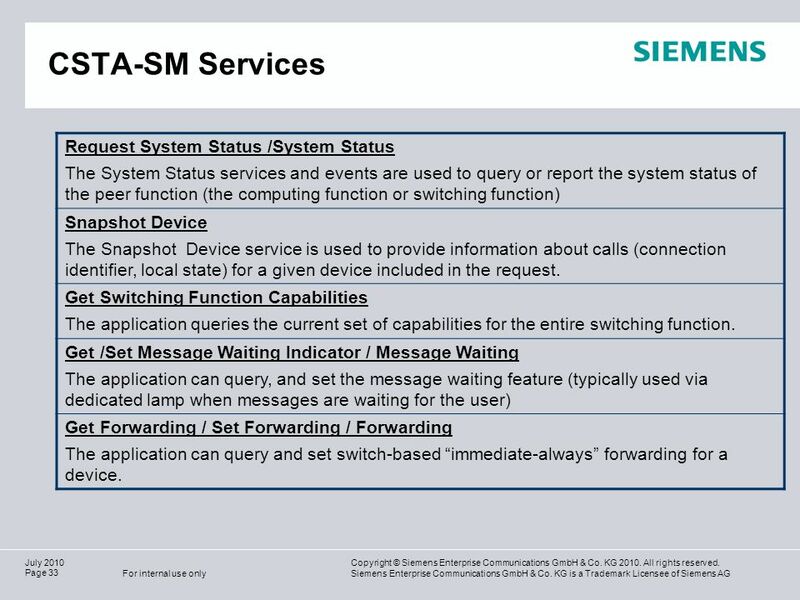 The message waiting feature is typically used to notify a user (typically via a dedicated lamp on a phone device) when messages are available. Set Microphone Mute* : The Set Microphone Mute service allows the computing function to control the microphone mute status of the microphone associated with one auditory apparatus at a specified device. 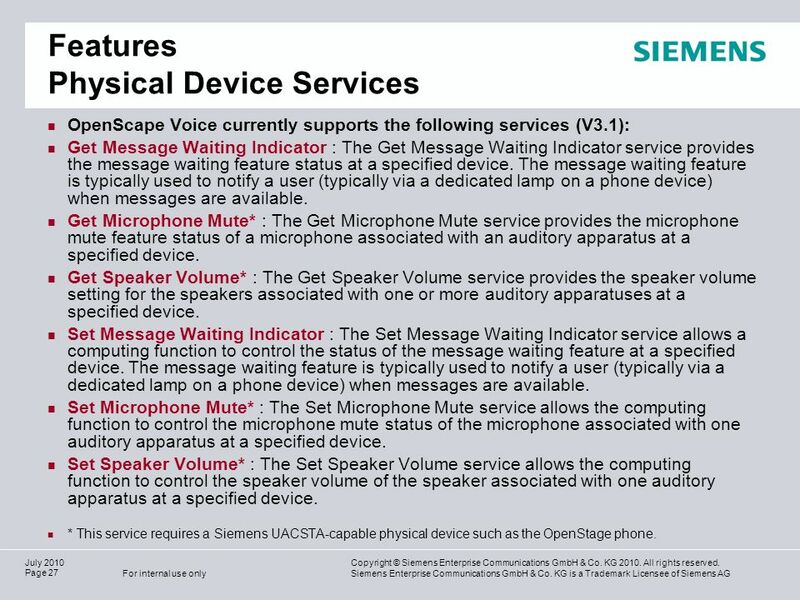 Set Speaker Volume* : The Set Speaker Volume service allows the computing function to control the speaker volume of the speaker associated with one auditory apparatus at a specified device. 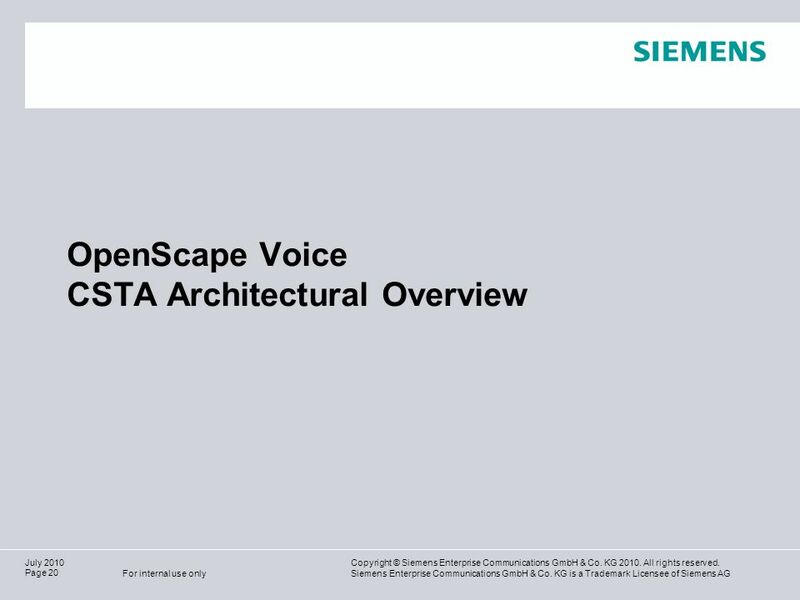 * This service requires a Siemens UACSTA-capable physical device such as the OpenStage phone. 28 9,825,461,087,64 10,91 6,00 0,00 Copyright © Siemens Enterprise Communications GmbH & Co. KG 2010. All rights reserved. 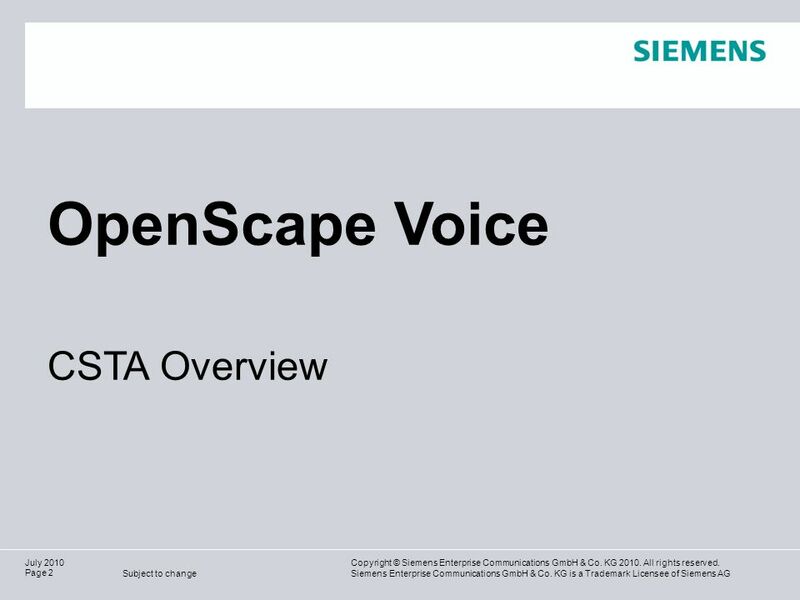 Siemens Enterprise Communications GmbH & Co. KG is a Trademark Licensee of Siemens AG For internal use only Page 28 July 2010 Features Logical Device Services OpenScape Voice currently supports the following services (V3.1): Get Forwarding: The Get Forwarding service provides the forwarding feature status at a specified device. The status returned may consist of one or more forwarding types that are active at the specified device based on user defined conditions. Get Agent State: The Get Agent State service provides the agent state at a specified device. Get Do Not Disturb: The Get Do Not Disturb service provides the do not disturb feature status at a specified device. Set Forwarding: The Set Forwarding service allows the computing function to control the forwarding feature at a specified device based on user defined conditions. The forwarding feature is used to redirect calls that arrive at a specified device to an alternate destination. Set Agent State: The Set Agent State service requests a new agent state at a specified device. 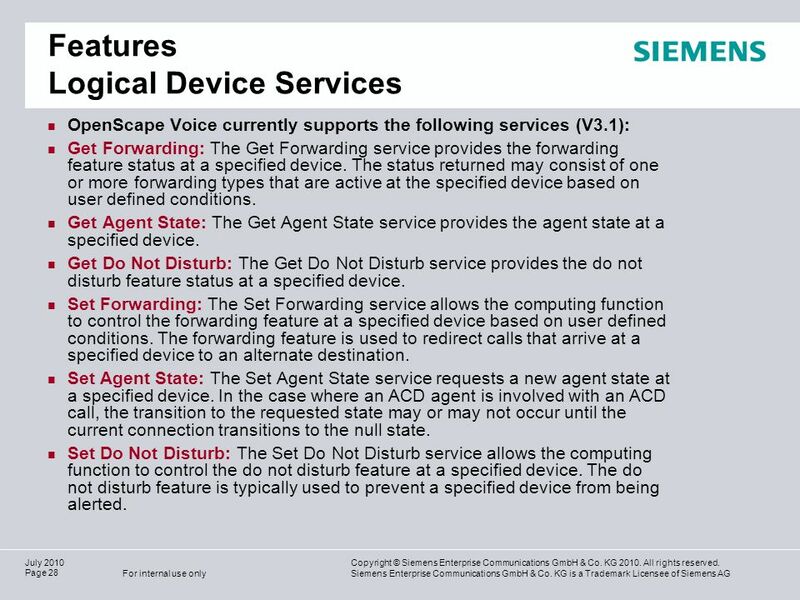 In the case where an ACD agent is involved with an ACD call, the transition to the requested state may or may not occur until the current connection transitions to the null state. Set Do Not Disturb: The Set Do Not Disturb service allows the computing function to control the do not disturb feature at a specified device. The do not disturb feature is typically used to prevent a specified device from being alerted. 29 9,825,461,087,64 10,91 6,00 0,00 Copyright © Siemens Enterprise Communications GmbH & Co. KG 2010. All rights reserved. Siemens Enterprise Communications GmbH & Co. KG is a Trademark Licensee of Siemens AG For internal use only Page 29 July 2010 Features: Snapshot Services OpenScape Voice currently supports the following services: Get Forwarding: The Get Forwarding service provides the forwarding feature status at a specified device. The status returned may consist of one or more forwarding types that are active at the specified device based on user defined conditions. 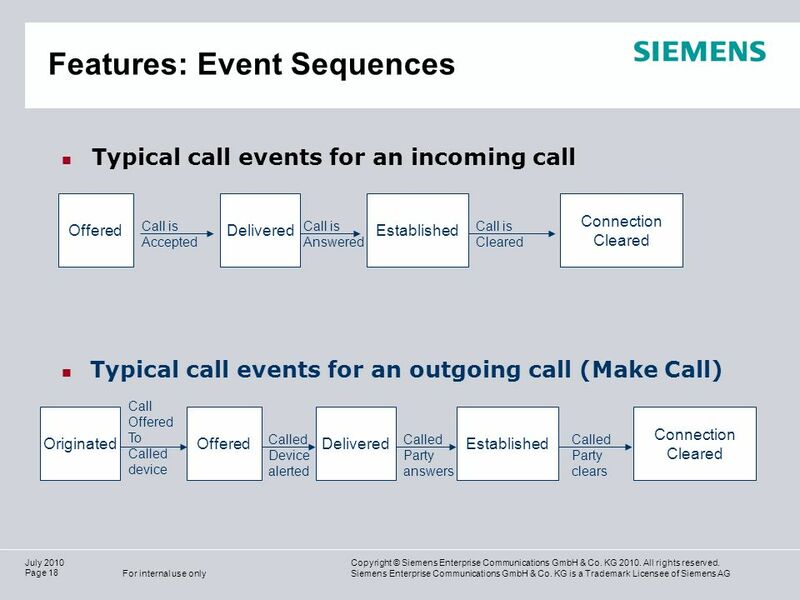 Snapshot Call: The Snapshot Call service provides information about the devices participating in a specified call. 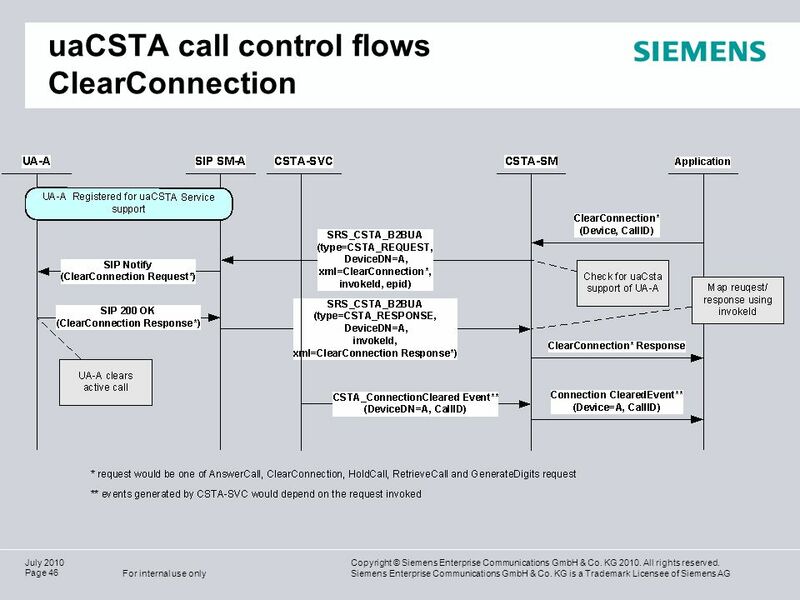 The information provided includes device identifiers, their connections in the call, and local connection states of the devices in the call as well as call related information. 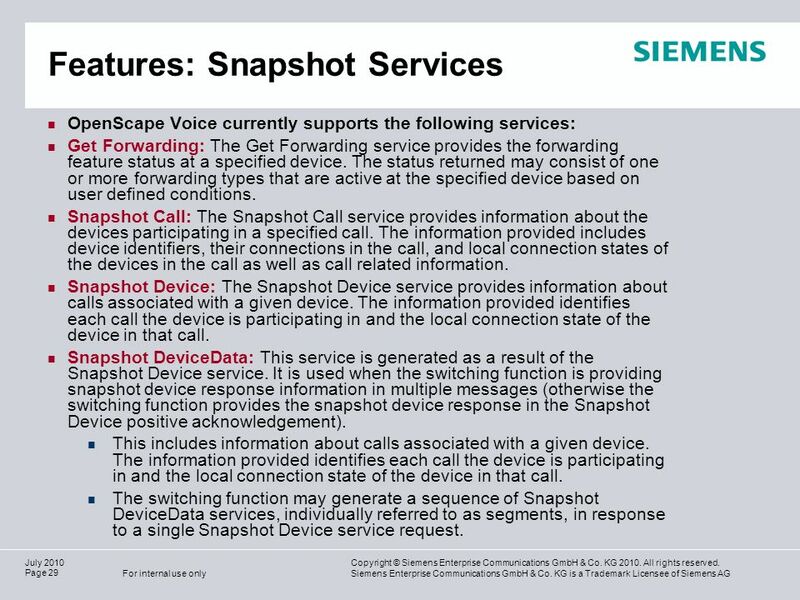 Snapshot Device: The Snapshot Device service provides information about calls associated with a given device. 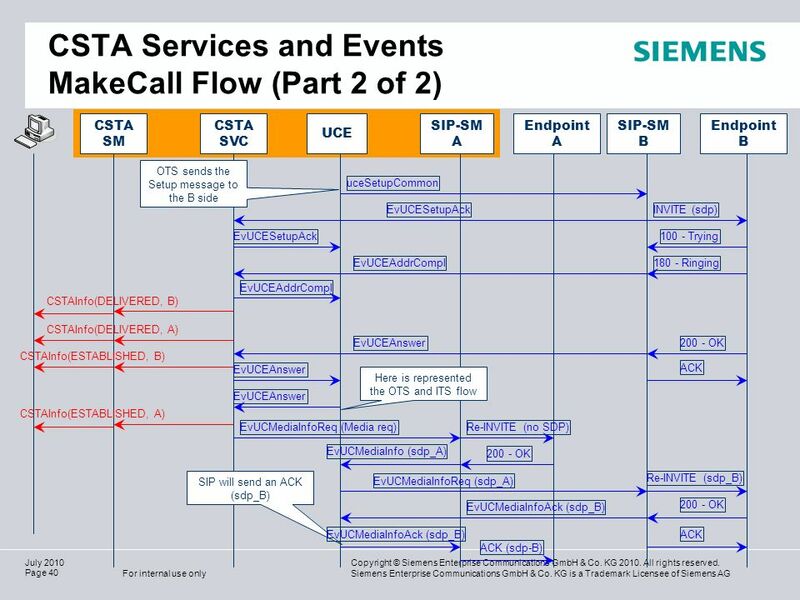 The information provided identifies each call the device is participating in and the local connection state of the device in that call. Snapshot DeviceData: This service is generated as a result of the Snapshot Device service. It is used when the switching function is providing snapshot device response information in multiple messages (otherwise the switching function provides the snapshot device response in the Snapshot Device positive acknowledgement). 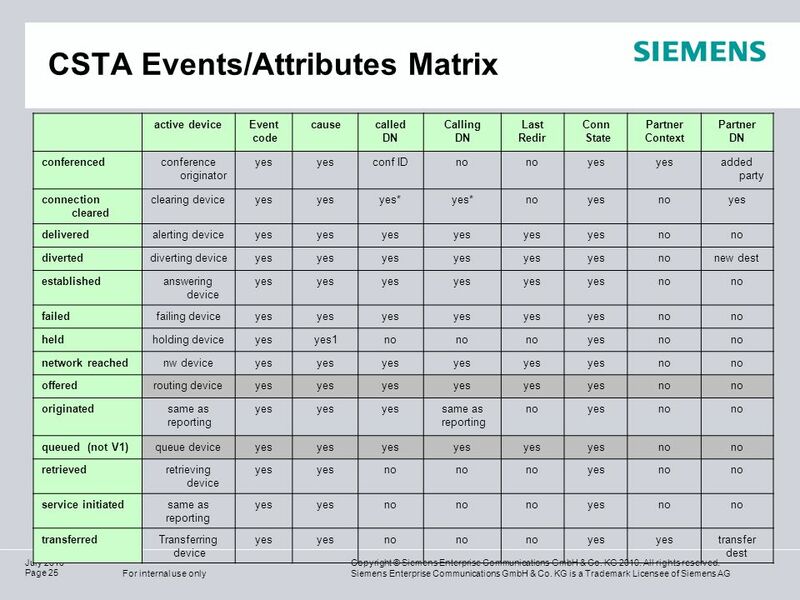 This includes information about calls associated with a given device. 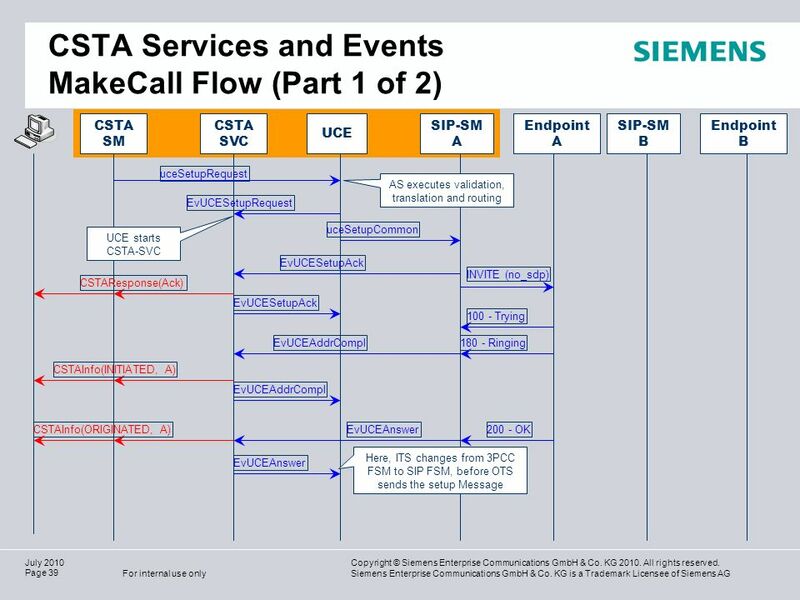 The information provided identifies each call the device is participating in and the local connection state of the device in that call. The switching function may generate a sequence of Snapshot DeviceData services, individually referred to as segments, in response to a single Snapshot Device service request. 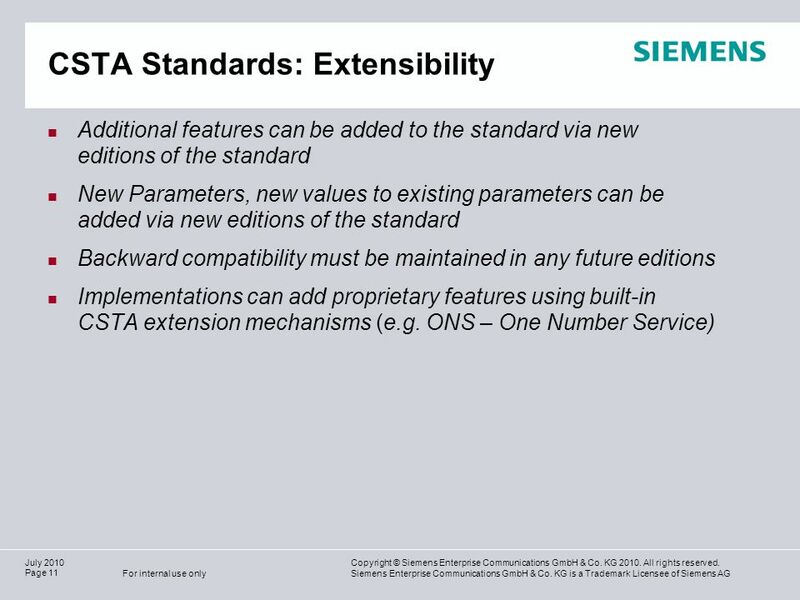 32 9,825,461,087,64 10,91 6,00 0,00 Copyright © Siemens Enterprise Communications GmbH & Co. KG 2010. All rights reserved. 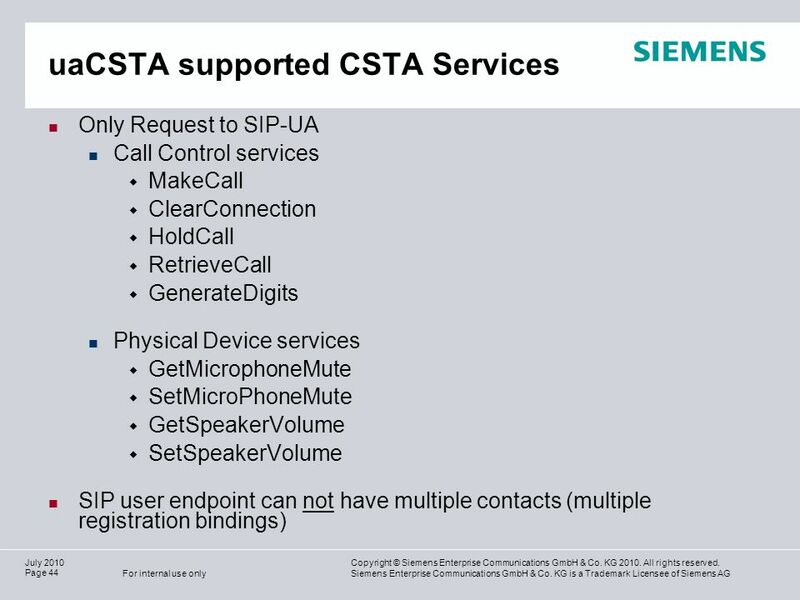 Siemens Enterprise Communications GmbH & Co. KG is a Trademark Licensee of Siemens AG For internal use only Page 32 July 2010 CSTA Signaling Manager Services Monitor Start /Monitor Stop With a Monitor Start the CSTA applications requests that a device be monitored. 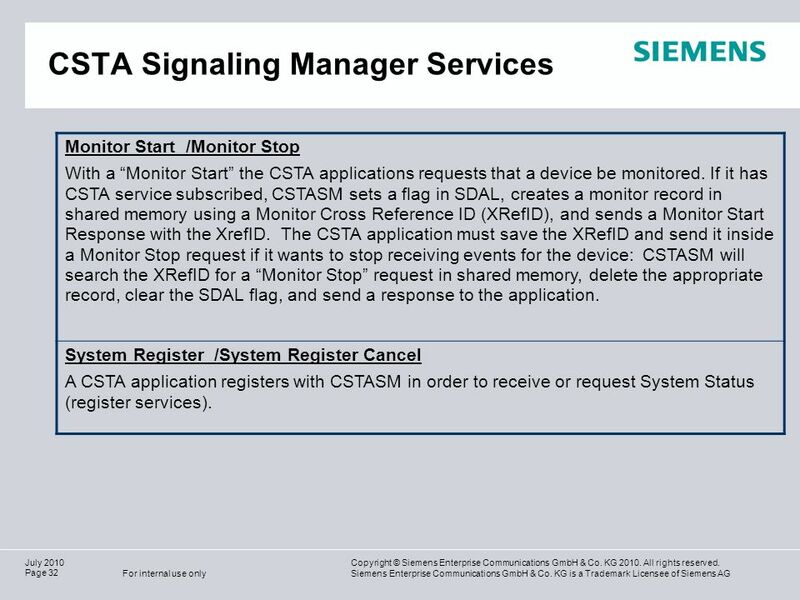 If it has CSTA service subscribed, CSTASM sets a flag in SDAL, creates a monitor record in shared memory using a Monitor Cross Reference ID (XRefID), and sends a Monitor Start Response with the XrefID. The CSTA application must save the XRefID and send it inside a Monitor Stop request if it wants to stop receiving events for the device: CSTASM will search the XRefID for a Monitor Stop request in shared memory, delete the appropriate record, clear the SDAL flag, and send a response to the application. System Register /System Register Cancel A CSTA application registers with CSTASM in order to receive or request System Status (register services). 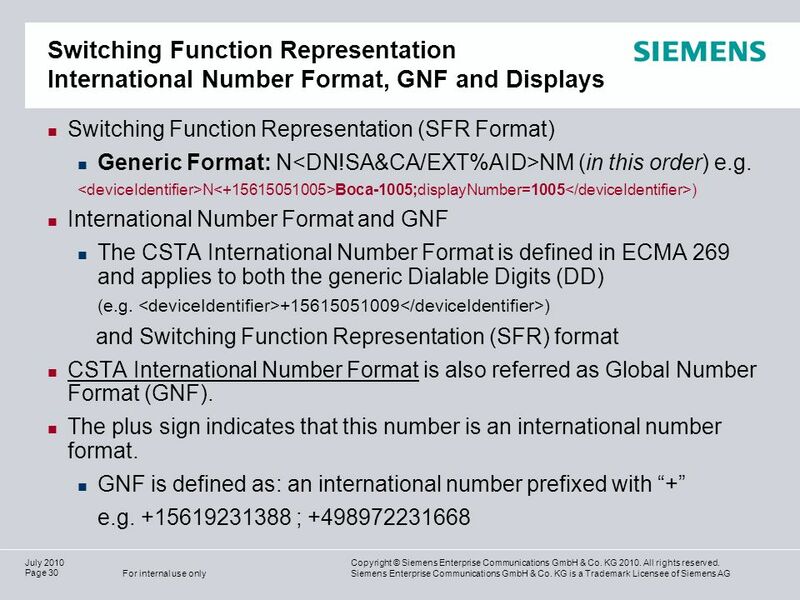 33 9,825,461,087,64 10,91 6,00 0,00 Copyright © Siemens Enterprise Communications GmbH & Co. KG 2010. All rights reserved. 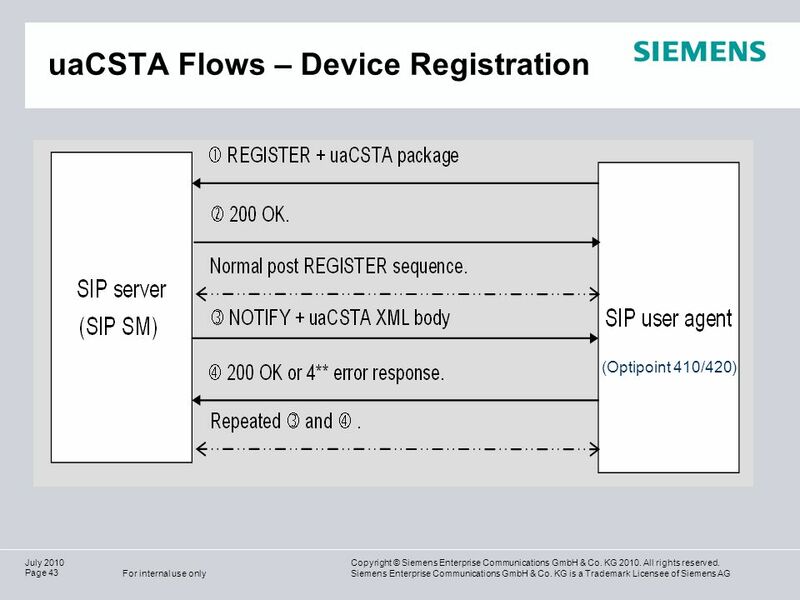 Siemens Enterprise Communications GmbH & Co. KG is a Trademark Licensee of Siemens AG For internal use only Page 33 July 2010 CSTA-SM Services Request System Status /System Status The System Status services and events are used to query or report the system status of the peer function (the computing function or switching function) Snapshot Device The Snapshot Device service is used to provide information about calls (connection identifier, local state) for a given device included in the request. Get Switching Function Capabilities The application queries the current set of capabilities for the entire switching function. Get /Set Message Waiting Indicator / Message Waiting The application can query, and set the message waiting feature (typically used via dedicated lamp when messages are waiting for the user) Get Forwarding / Set Forwarding / Forwarding The application can query and set switch-based immediate-always forwarding for a device. 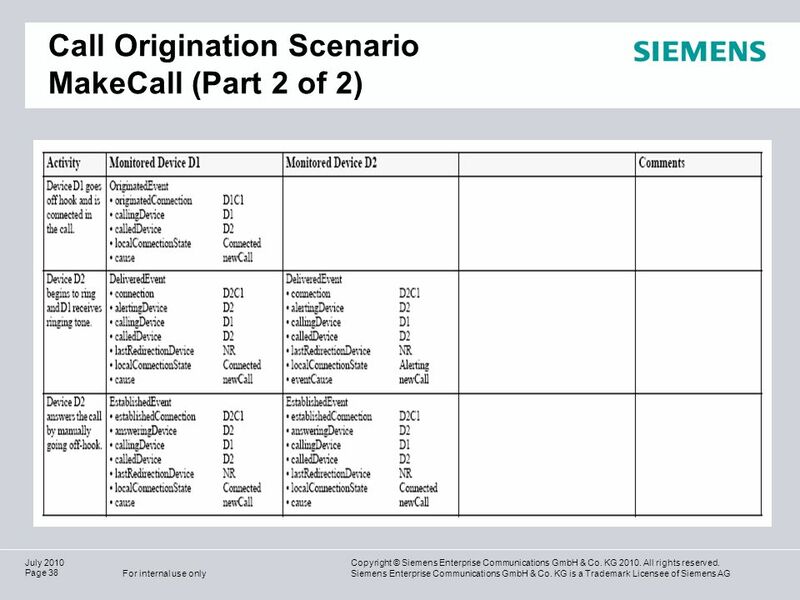 34 9,825,461,087,64 10,91 6,00 0,00 Copyright © Siemens Enterprise Communications GmbH & Co. KG 2010. All rights reserved. 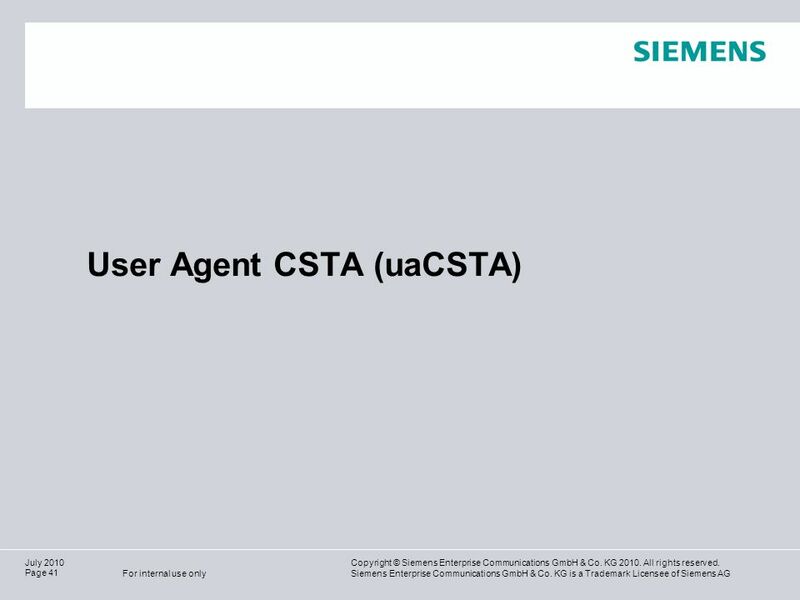 Siemens Enterprise Communications GmbH & Co. KG is a Trademark Licensee of Siemens AG For internal use only Page 34 July 2010 CSTA Service Basics UCE framework starts the CSTA service, if provisioned, for the subscriber once the UCE detects a call to that subscriber. 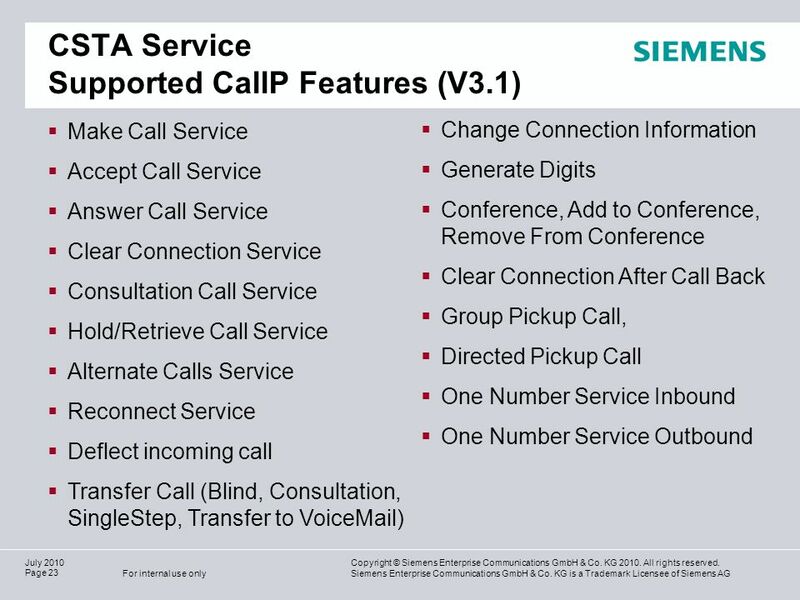 An instance of the service is started for each leg of the call. 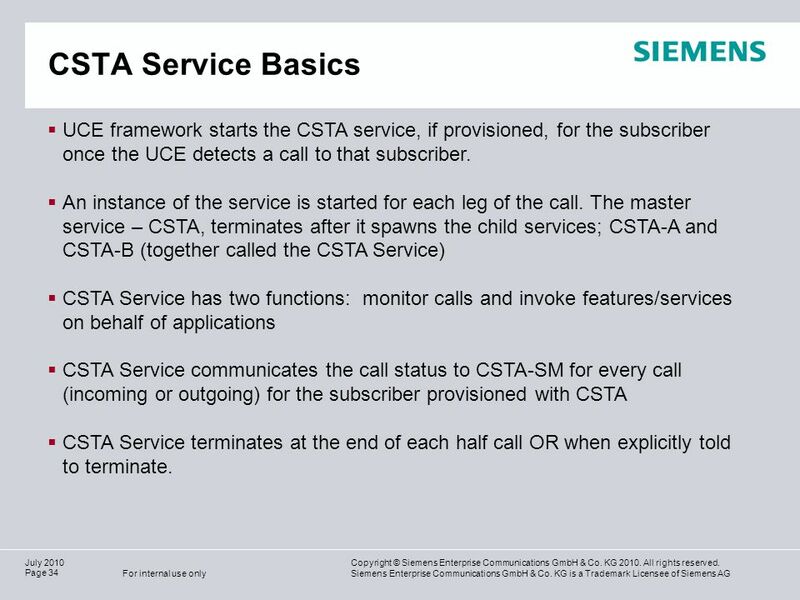 The master service – CSTA, terminates after it spawns the child services; CSTA-A and CSTA-B (together called the CSTA Service) CSTA Service has two functions: monitor calls and invoke features/services on behalf of applications CSTA Service communicates the call status to CSTA-SM for every call (incoming or outgoing) for the subscriber provisioned with CSTA CSTA Service terminates at the end of each half call OR when explicitly told to terminate. 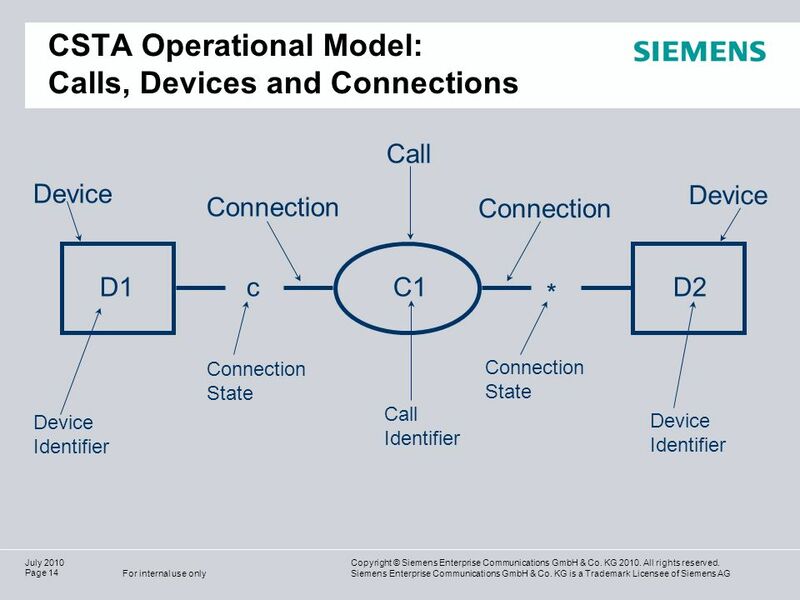 42 9,825,461,087,64 10,91 6,00 0,00 Copyright © Siemens Enterprise Communications GmbH & Co. KG 2010. All rights reserved. 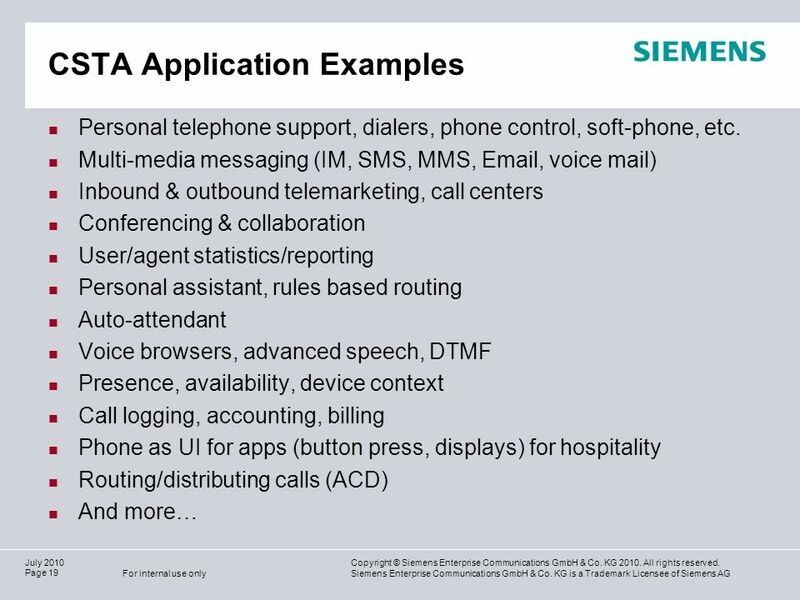 Siemens Enterprise Communications GmbH & Co. KG is a Trademark Licensee of Siemens AG For internal use only Page 42 July 2010 uaCSTA To provide better feature activation 1 st party feature activation instead of 3 rd party feature activation by directly sending the request to the phone and phone initiating the request. 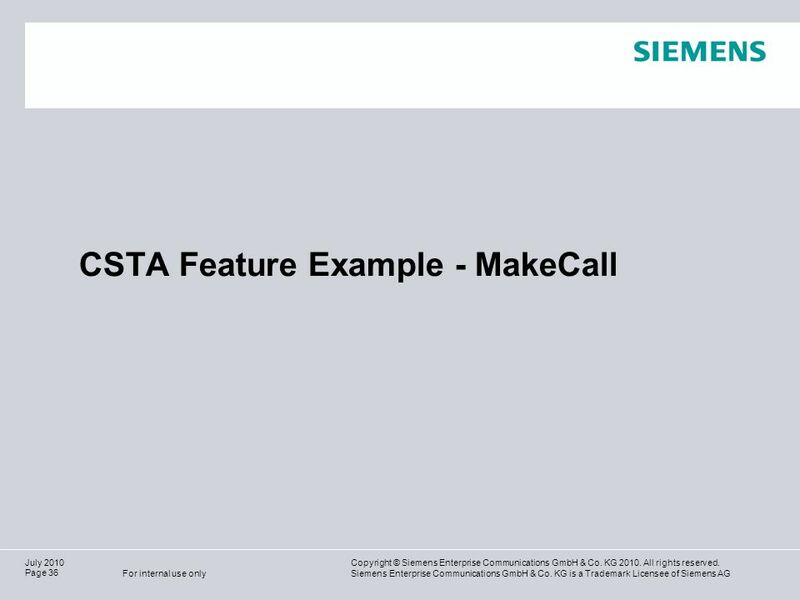 Eg: MakeCall, ClearConnection, etc. Performance enhancement By reducing the message interaction. 1 st party feature activation results in fewer messages than 3 rd party. 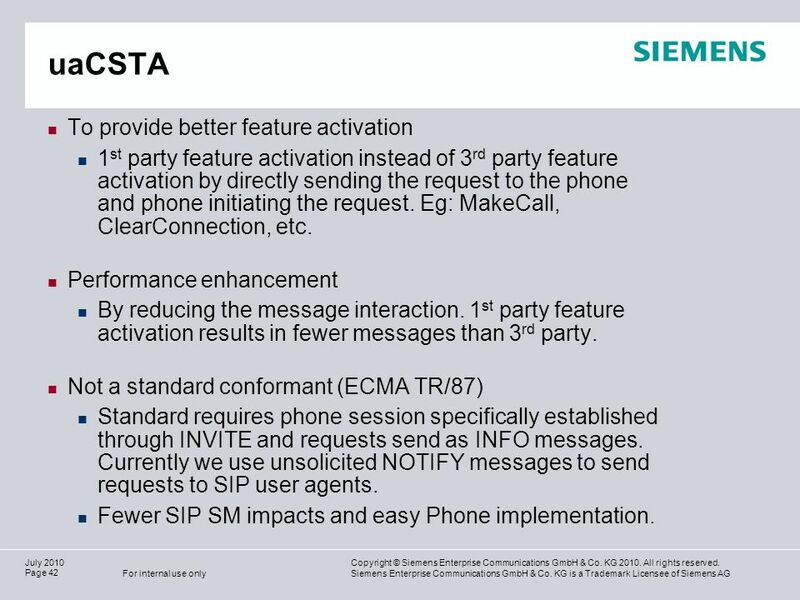 Not a standard conformant (ECMA TR/87) Standard requires phone session specifically established through INVITE and requests send as INFO messages. Currently we use unsolicited NOTIFY messages to send requests to SIP user agents. Fewer SIP SM impacts and easy Phone implementation. 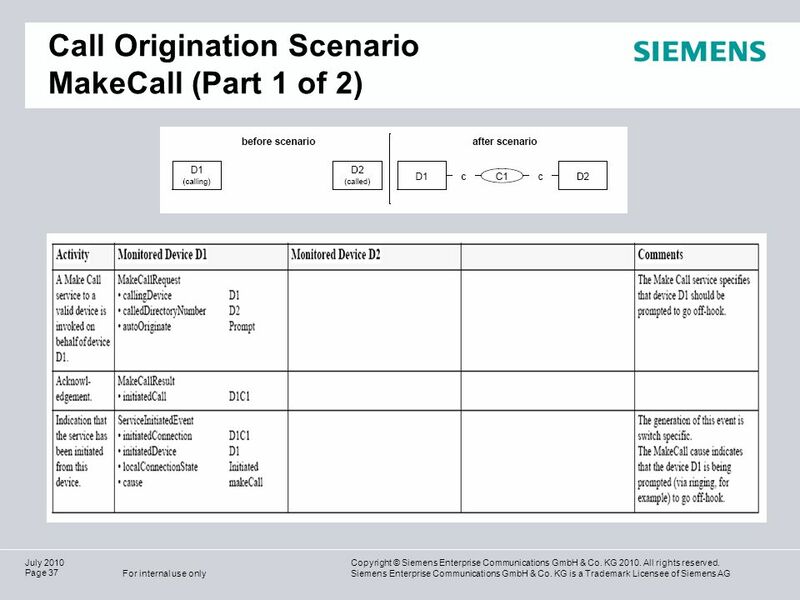 Download ppt "Copyright © Siemens Enterprise Communications GmbH & Co. KG 2010. All rights reserved. 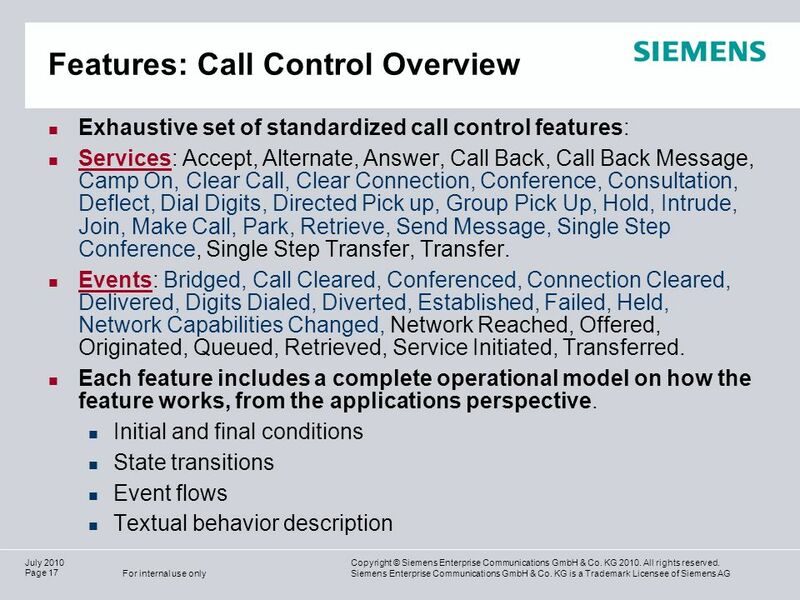 Siemens Enterprise Communications GmbH & Co. KG is a Trademark." 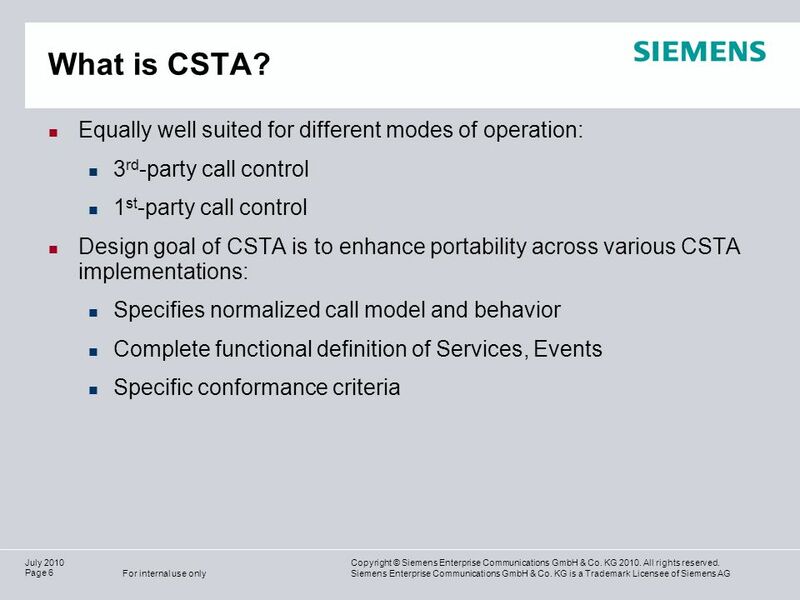 What is CSTA? 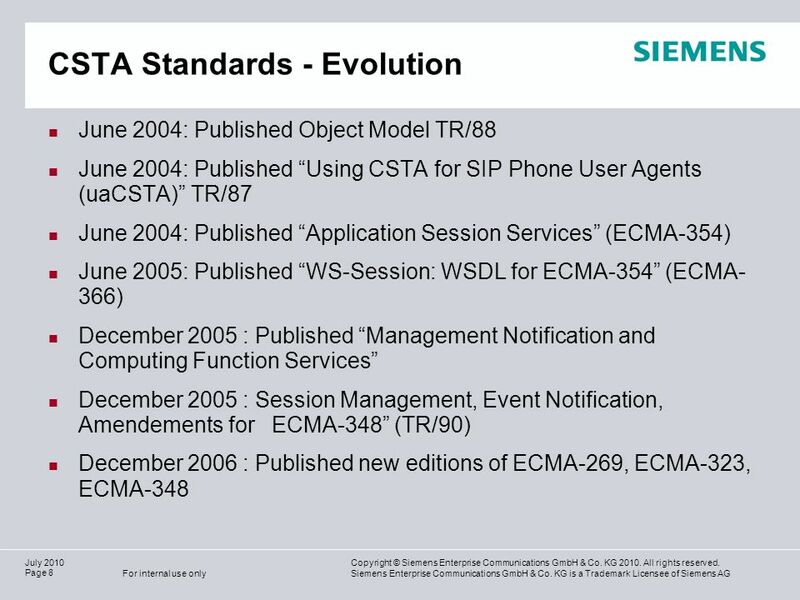 CSTA Overview Started by Tom Miller (Siemens), updated by Ecma/TC32-TG11, December 2005. Aspire Vertical Markets Banking, Finance and Insurance. M2M middleware service Inge Grønbæk, Telenor R&I ETSI Workshop on RFID and The Internet Of Things, 3rd and 4th December 2007. 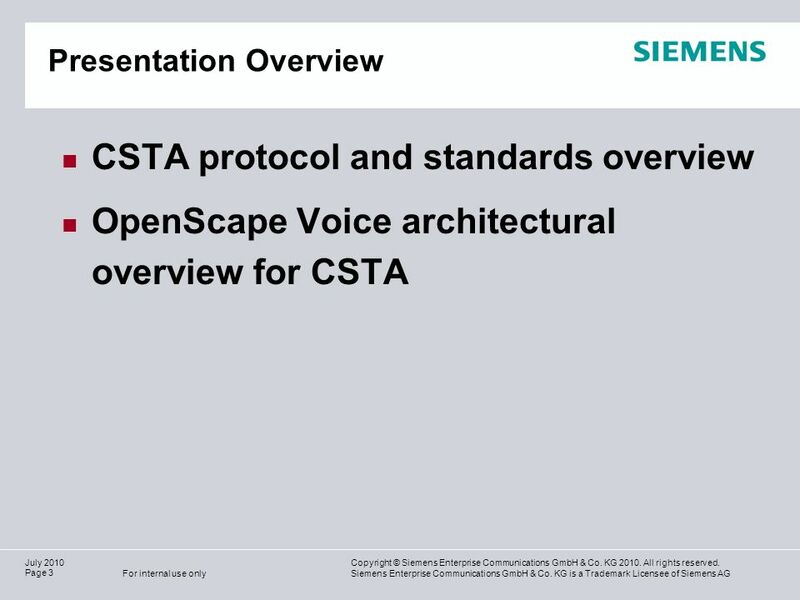 What is CSTA? 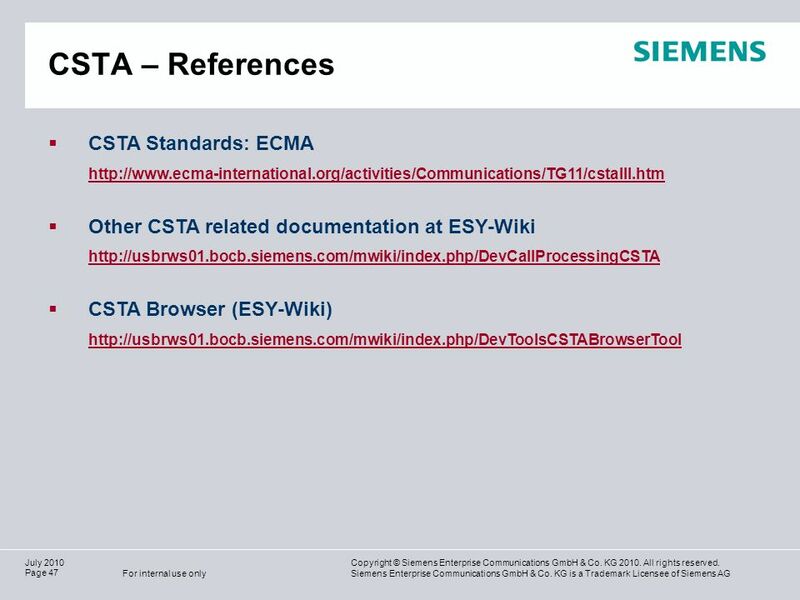 CSTA Overview Updated by TG11 April 2012 Ecma/TC32-TG11/2012/005. 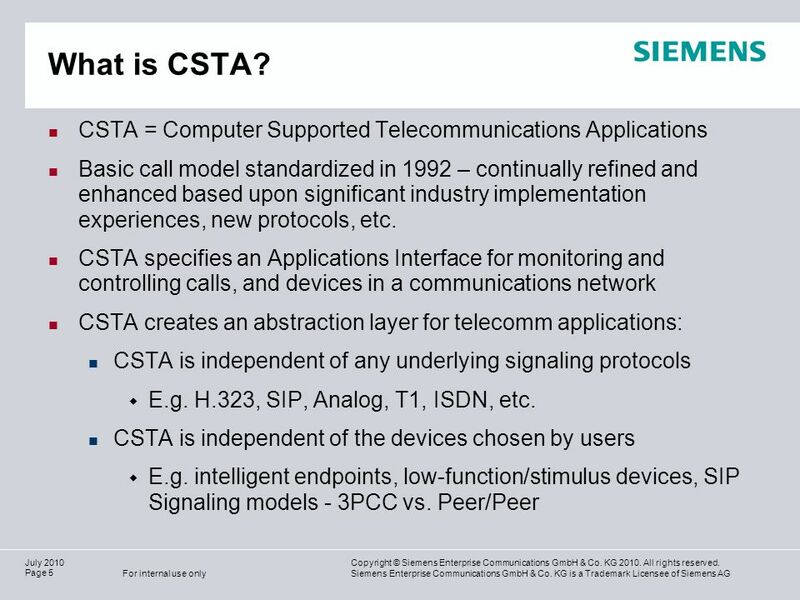 What is CSTA? 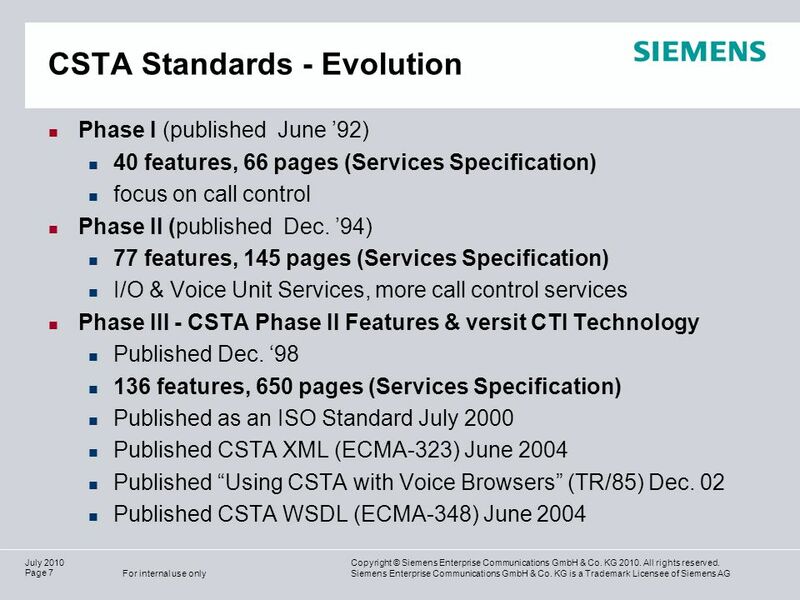 CSTA Overview Started by Tom Miller (Siemens), updated by Ecma/TC32-TG11, June Ecma/TC32-TG11/2004/40. Tom Miller February 2009 June 2009 Publications & Future Plans New CSTA Standards Enhancements Ecma/TC32-TG11/2009/011. 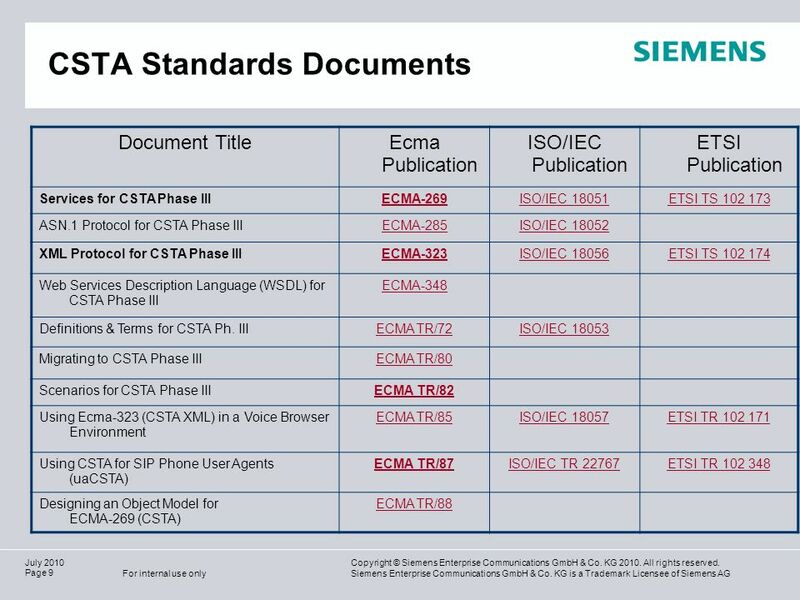 CSTA Standard Enhancements in 8 th edition Ecma/TC32-TG11/2012/004. Copyright© 2005, Objectworld Communications Corp. All rights reserved. Page 1 Intelligent Unified Communications End User Training CAO v3.2 04/05. XP New Perspectives on Browser and E-mail Basics Tutorial 1 1 Browser and E-mail Basics Tutorial 1.